Leo and Aries in love work well together because they understand each other. They are both able to recognize they are coming from the same place. The sun tends to be selfish, while Mars is about confrontational energy. This will somehow work to the advantage of these two zodiac signs. They can form a very dynamic team. The lion and the ram are both Fire signs. Because of this, the Leo Aries relationship will be marked by intensity and heat. Both Leo and Aries soul mates have incredible reserves of energy. Neither will want to slow down. Both are happiest when they are moving around, always doing something. These two zodiac signs might have frequent disagreements. However, they do not carry those disagreements with them. The Aries will be much too busy to even consider having time to hold a grudge. The lion will have to remember not to act resentful towards the ram if they feel they are not getting enough respect. Leo zodiac sign is a Fixed sign and Aries is a Cardinal sign. The ram will make the lion feel assertive. This will make the lion feel they can take more risks in their life. At the same time, the lion can help the ram to be more stable. This will help Aries star sign be able to finish the things they start. Leo man in love will need a lot of attention from their lovers. Aries can be a bit selfish and might not recognize the need to shower their lover with attention. These two sun signs could easily fight over what the lion demands of the ram. Leo is a royal sign and Aries is more of a hero. When these two fight for control, it is not a small scale thing. Their fight will be legendary. They are both egotistical and Arian will love to win. At the same time, Leo compatibility shows that they will love to be in control. These two zodiac signs will always find ways to compete with each other. Both the lion and the ram in this Leo and Aries compatibility are lacking in patience. Any decisions made on impulse by them are likely to be agreed upon at first. Given time, they might both regret their decisions. The Leo and Aries compatibility will be a romantic relationship that is electric. They are both Fire signs, which means there will be a lot of intensity and excitement in their relationship. The lion and the bull will both enjoy a healthy competition in their relationship. The Leo and Aries friendship will be very lively and not low key at all. In a Leo Aries love compatibility they are both very devoted to each other and their feelings for one another run deep. Leo and Aries marriage will be at its best when they can both understand that neither one absolutely has to be in control. When they understand that, their relationship can be happy and exciting. The best thing about a romantic relationship between Leo and Aries in love is that they both have a huge amount of admiration for each other. While Aries can easily start things, Leo can just as easily follow through with them. This gives them both a much needed niche in their relationship. They are both energetic and intense, which will give their love compatibility a lot of excitement. Leo dating an Aries are both intense and know how to express themselves. They will have an electric, sensual, dynamic relationship. At the same time, these two zodiac signs can easily represent two extremes. They will either work incredibly well together or not at all. Both signs can be somewhat bipolar, going from extremely happy to almost depressed. They will do this enough there will be something of a regularity to it that might astound those around them. The good thing in the Leo and Aries love compatibility is that these two still have a lot of love and respect for each other at the end of the day. If Leo can be practical, they will find a way to overlook some of their issues. The fights will not be petty, but they will not end in a Leo and Aries breakup either. The lion and the ram will stay together because they each have something the other one is lacking. The are very similar, but they also can learn quite a bit from each other. The Leo and Aries in bed will be marked by tenderness, passion, and truth. At this point in the relationship, both Leo and Aries will have equal control and importance. They will have common goals and expectations in life. They are both motivated and driven. Their relationship will likely be one of material comforts. There is a small possibility that either one could be so determined and focused on achieving a goal they forget to live life. The Leo and Aries compatibility will have a relationship that is based on fiery intensity, domineering qualities, and who and when each are in control. Both these zodiac signs tend to lack patience and are more than capable of being prideful. The Leo man or Leo woman enjoys feeling their partner’s adoration. Their egos will benefit from Leo hearing flattering compliments. However, the Aries man or woman has a short attention span and gets bored easily. Because of this, they might not be able to give the lion what he or she needs. The lion can be flirty at times and this could bother the ram. However, the Leo Aries sexuality will never be dull. When Leo men and Aries women have to talk about their differences, things can get loud. The ram will still look to the lion for guidance though. These two zodiac signs can definitely overcome any significant differences they have together. Both Leo and Aries are typically easily respected by others. They will both need to remember that they have to respect each other in their relationship. The sun will rule over Leo. The planet Mars will rule over Aries. These two zodiac signs will both have male energies to them. However, when things are tough, they are really tough. There will be a lot of noisy fights and blows to the egos of Leo males and Aries females. These two zodiac signs are always going to be in competition about who is truly in control. Romantic relationships really should not be about who holds the power. Because of this, the Leo Aries love astrology predictions show that they relationship can have issues. However, these two zodiac signs can have issues when both of them want to be in control. They will both be somewhat egotistical and they can clash because of this shared horoscope personality. They will both have a lot of love and acceptance for each other. However, in the Leo Aries love compatibility both will have to learn to step back and let the other take control once in an awhile. They will need to take turns making even seemingly mundane, every day decisions. Aries compatibility shows that the ram does not always think before they speak and they might end up unintentionally hurting the lion’s feelings. At the same time, those with Aries birthdays might be annoyed at how the lion like to take charge and tends to pout when they do not get their way. If Aries star sign is too straightforward, then Leo’s ego could be hurt. At the same time, those with a Leo birthday will have a superiority complex that Aries will not tolerate. These two will find it easy to lose their tempers. Both of them have fiery personalities and neither one will be willing to give in to the other. The lion and the ram can have issues if one of them feels they are lesser than the other. They are both self sufficient and they both need successes for themselves, instead of sharing everything. This is a point where the equality in the relationship does not reach. In the Leo and Aries marriage compatibility will both understand the demands of each other’s life. They will work extremely well together unless one of them suffers a setback and sees the other experiencing more success. 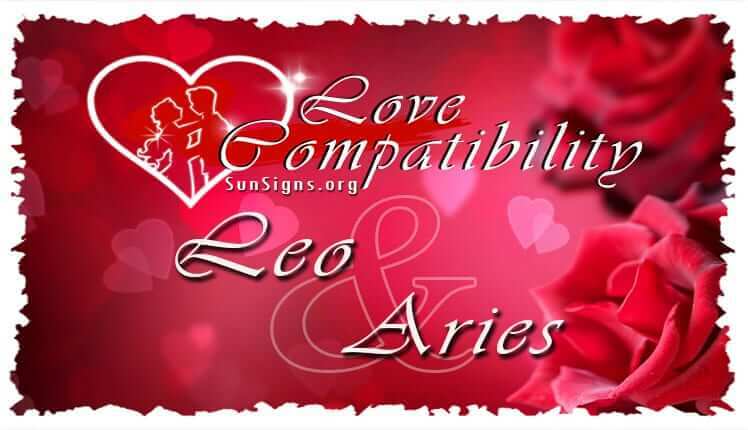 Leo and Aries compatibility can be exceptionally good together.